The flagship of the Mercedes-Benz SUV line is the three-row, seven-passenger, luxury GL-Class. First introduced in 2006, the GL-Class shares the same architecture with the M-Class, and is produced in the Tuscaloosa County, Alabama plant. Since its unveiling in 2006, the GL-Class has been a favorite in its segment, offering plenty of amenities, space, and power. The expertly crafted SUV combines size and on-road comfort, for a driving experience unlike any other. Ranked number one in luxury large SUVs by U.S. News and World Report, the GL-Class is not only staying ahead of the competition, it is far surpassing it. One of the most unique aspects of the GL-Class, is its extensive cabin and cargo capacity. With more versatility than ever before, the 2015 GL-Class is changing the way we think about cargo. Most SUVs were designed to accomplish a lot of different things. Towing large items, entertaining passengers, and even keeping them safe - are all areas that the GL-Class SUV shines again, and again. The luxury SUV segment has long been led by Mercedes-Benz vehicles. The GL-Class is not only the brand’s flagship SUV, it is also one of the best-selling, most awarded large luxury SUVs on the market. After combining input from drivers, and thoroughly test driving various vehicles, U.S. News and World Report has ranked the 2015 GL-Class SUV three out of nine luxury large SUVs on the road today. The Mercedes GL-Class beats out tough competitors like the Lexus LX, Range Rover, and the Audi Q7. Standing tough next to the competition is something Mercedes-Benz does well, thanks to their extensive list of standard features, amenities, and world-renowned luxury. The 2015 Mercedes GL-Class also beat out a long list of luxury SUVs with three rows, by the same publication. The Acura MDX, Lexus LX, Infiniti QX60, and the Lincoln Navigator, all fell behind the convenience and functionality of the 2015 GL-Class. With a starting MSRP of only $63,600, the GL-Class is making luxury large SUVs more attainable, and with its long list of awards and accolades, drivers are sure to be impressed with everything the 2015 Mercedes-Benz GL-Class offers. Driving a large SUV doesn’t mean much, unless you are able to utilize every square inch of interior space. Mercedes-Benz went to great lengths to ensure that the interior of the GL-Class would not only be spacious, but entirely functional. With seating for seven passengers, there is no question that the 2015 GL-Class has plenty of interior space. But what happens when those rear seats fold down, and the interior of the SUV is opened up? Glad you asked. Seating for Seven - The three rows of seating featured on the GL-Class are not only spacious, they are practical. With Easy-Entry second row seats, getting into the back of a GL-Class SUV is not only easier - it’s a breeze. Children no longer need to be banished to the third row, when adults can seamlessly make the transition from the second to third row of seating. From Sitting to Storage - The standard power-folding third row of seating in the 2015 GL-Class, helps drivers make extra room, quickly and easily. Each seat can be individually folded flat in less than five seconds, with the simple touch of a button. The second row has a 60/40 split configuration, which combined can allow for up to 93.8 cubic feet of cargo. Flexible Cargo Space - The interior of the GL-Class allows for nearly 94 cubic feet of cargo, and thanks to the floor-mounted tie downs, grocery bag hooks, and floor-mounted tie downs, storing and transporting cargo is a breeze. Drivers can utilize the retractable cargo cover for added security, when hauling items. A 115-volt power outlet comes standard in the rear cargo area. Whether blowing up air mattresses, charging mobile devices, or something else - the GL-Class will keep you powered up on the go. Power Liftgate - Accessing interior cargo is easy, with the standard power liftgate. A touch of a button can both open and close the liftgate, which will automatically stop if an obstruction is detected. Drivers can even set a predetermined height for the liftgate to stop at, to avoid collisions with low ceilings. The 2015 Mercedes GL-Class is an SUV that serves multiple purposes. The athletic and aerodynamic body style ensures ultimate performance, while the luxurious interior makes on the road comfort a priority. The GL-Class performs in every area that it was made to, helping both drivers and passengers have a better experience on the road. Explore the ways in which the 2015 GL-Class lives up to high standards of the luxury SUV segment. Performance: Drivers can choose from four different engines, each with advanced Direct Injection technology for more power, torque, and increased efficiency. 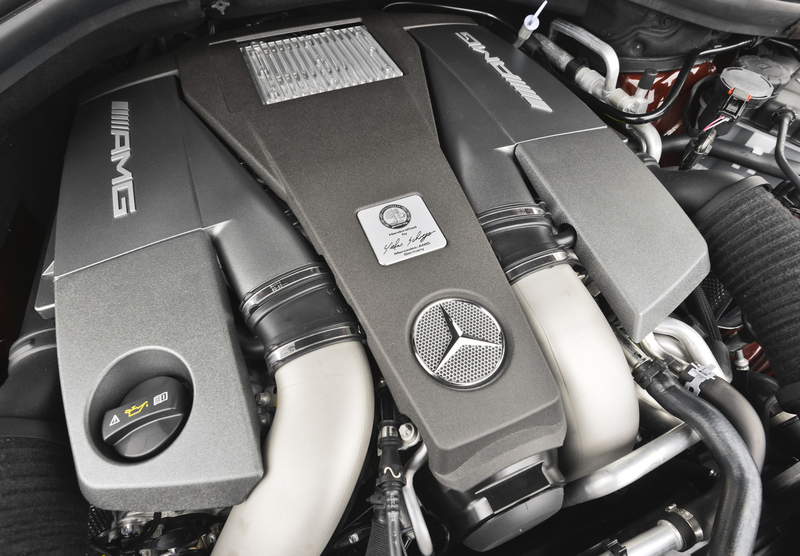 A brand new biturbo V6 and BlueTEC clean-diesel engine are both new to the 2015 lineup. Each engine is certified ultra low emissions, without sacrificing an ounce of performance. Power: With up to 550 horsepower, and a max pound-feet of torque at 560, the GL-Class offers plenty of power under its hood. All 2015 GL-Class SUVs can tow up to 7,500 pounds. Drivers can even opt for Mercedes’ advanced 4Matic all-wheel-drive system, for an even greater power performance. Entertainment: The rear entertainment system features two large screens situated behind each front head restraint, allowing for passengers to watch DVDs, and play video games. The advanced technology allows for passengers to watch together, or use each screen independently from one another. Wireless headsets are included with this system. Safety: Advanced safety technology is no stranger to Mercedes-Benz, and the autobrand made sure to include plenty of it in the 2015 GL-Class. Distronic Plus cruise control, Blind Spot monitoring, Lane Keeping Assist, and other safety features ensure the safest passage possible on the road ahead. The 2015 GL-Class was truly designed to conquer the luxury SUV segment, and deliver a high performing, safe, and fun ride, every time.